New York Red Bulls Forward Bradley Wright-Phillips has been voted the Alcatel MLS Player of the Week by the North American Soccer Reporters (NASR), Major League Soccer announced today. 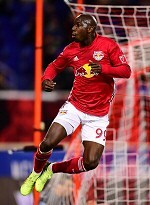 Wright-Phillips earned the recognition after netting a brace in the Red Bulls 3-0 home win over Minnesota United FC on Saturday night. Wright-Phillips struck once on either side of half time to seal the three points for New York. He put the Red Bulls ahead 2-0 in the 42nd minute with an over-the-shoulder heel touch, redirecting a free kick from Homegrown midfielder Sean Davis that was headed-on by Tim Parker. BWP then added an MLS Goal of the Week candidate in the 78th minute, running onto a curling through ball from Homegrown Alex Muyl and using his first touch to strike the ball over the shoulder of Lampson and into the far side of the net. Wright-Phillips has three goals and an assist in three MLS Games, and six goals and four assists across seven matches, including four games in the Scotiabank CONCACAF Champions League. In his MLS career, Wright-Phillips has 89 regular season goals, currently tied with Carlos Ruiz for 11th on the MLS all-time scoring list. BWP's career tally includes 88 since the start of the 2014 season, the most goals scored is the most by an MLS player over a five-year span. Wright-Phillips is just three games into the fifth season of that count. Saturday night was Wright-Phillips' 19th career multi-goal game, moving him into sole possession of fifth place all-time in league history. BWP now has 15 career MLS regular-season braces.